Applying for a job is nowadays. You can just shoot off an email or upload it to a job site in a matter of a few seconds. That is precisely what most people do. They just apply for every job that they see that might be right for them. This is one of the reasons why recruiters now have such a hard time. They receive many hundreds of applications for every post that they advertise. Your human resources manager resume, therefore, has to be something special if you are going to get an interview. Whether you are applying for a position as an HR manager or writing a mechanical engineer resume you have to do so in a way that is going to clearly show the reader in a matter of a few seconds that you are qualified for the job. Your job application will only be under the nose of the recruiter for a few seconds as they look for the evidence that you will be right for the role. If they don’t see the information that they want to see in that brief look then your chances are over. Writing that resume that is going to get you an interview is not easy at all. This is why so many applicants that are serious about applying for a job will get professional help. We can provide you with all of the support that you need to ensure that you fully understand how your resume should be put together to land you that HR role that you really want. Why Apply for a Role in HR? HR is one of those roles that can be applied to many different industries and as such can offer steady and also lucrative employment. The median pay for human resources manager in the US is almost $107 thousand per year with just a bachelor’s degree qualification. This area also offers steady growth with the job pool expected to grow by 9% between now and 2026. As such it is a popular role and one that you will have to compete for if you see a vacancy advertised. Never send the same resume to every job that you see. Every job has different requirements and you will have to make sure that your resume reflects those requirements perfectly if you are to have any chance of being selected. Writing an overlong resume that covers every possible question about you. Excessive information just makes your resume untidy and will hide the information that they do want to see. Listing your responsibilities for each job you have held: they already know what the role entails so they will want to know how good you are at performing the job. Including a human resources manager resume objective: this is outdated and rather than trying to match you to what the company wants it is all about what you want. It is likely to harm rather than help your application. 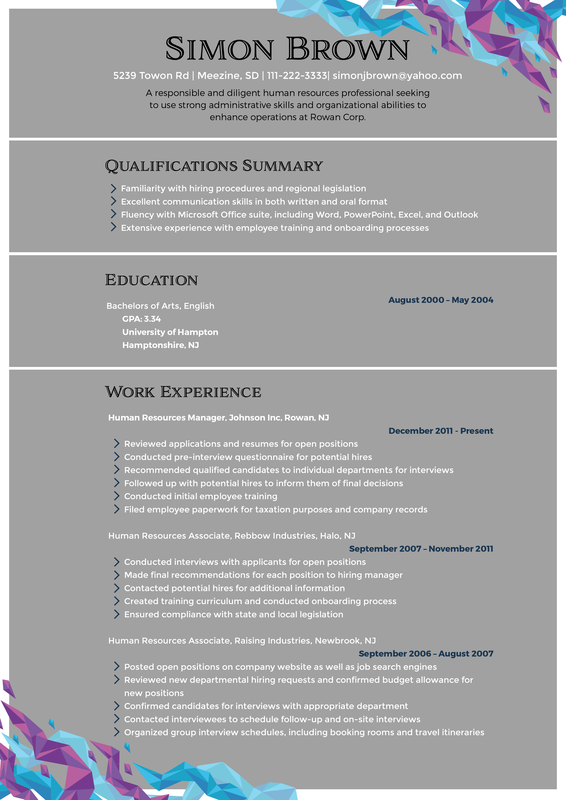 Using a cluttered or decorated resume format on which it is difficult to find any information. After all, he deciding factor is the content of your resume, not its appearance. Looking at human resource manager resume samples is a great place to start for learning how to write your own. However don’t simply copy what you see there. If you want to write a resume that is going to get you noticed then you need to use the following advice. Use a format that is going to be easy to read. Aim for wide margins on all sides and allow for blank space prior to each section to draw the eyes clearly there. Use easy-to-read text: Arial or Times New Roman in 12pt so that it is clear. Use a human resources manager resume headline that will sum you up in a few words: “Highly Experienced Human Resources Manager in the Automotive Industry” for instance. Review the job advert carefully and their website if possible to identify exactly what they are looking for. The specific skills and qualifications need to be covered fully within your resume. Arrange sections using the more traditional headings: skills, experience, qualifications, etc. Ensure that the most important things they are looking for appear first in each section so that they are seen immediately. Qualify your skills by giving examples of your achievements. Where possible quantify them and make them as specific as possible for your human resources manager resume experience. If you cannot show results in your previous roles then you are unlikely to be hired. Proofread everything carefully: this is your first contact with your future employer and you want to make the best first impression. 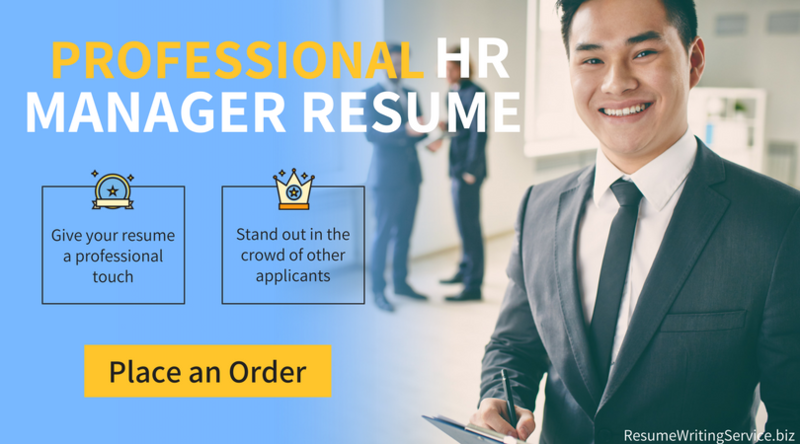 We offer fully professional top rated resume writing services through some of the best-qualified HR recruitment specialists that you will find online. Our experts work directly with you to ensure that you resume will carefully reflect just what the recruiter will need to see in an effective manner. Our tailored resumes are totally original to you and are carefully proofread prior to delivery to you on time. If you don’t like any part of the resume you only need talk with your expert and changes will be made until you are fully satisfied. We offer a full satisfaction money back guarantee and want you to be able to submit your application with confidence as you start preparing for an interview. Make your next application a successful one with the help and support of our professional writing services for your human resources manager resume.